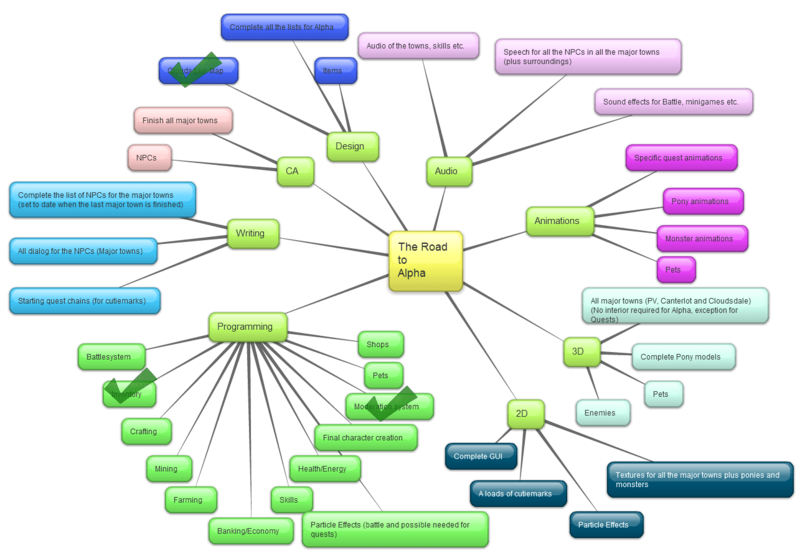 As promised, the road to alpha is now published on the frontpage. Congratulations Chishio Kunrin! July 2012 Notable Pony Nominations! 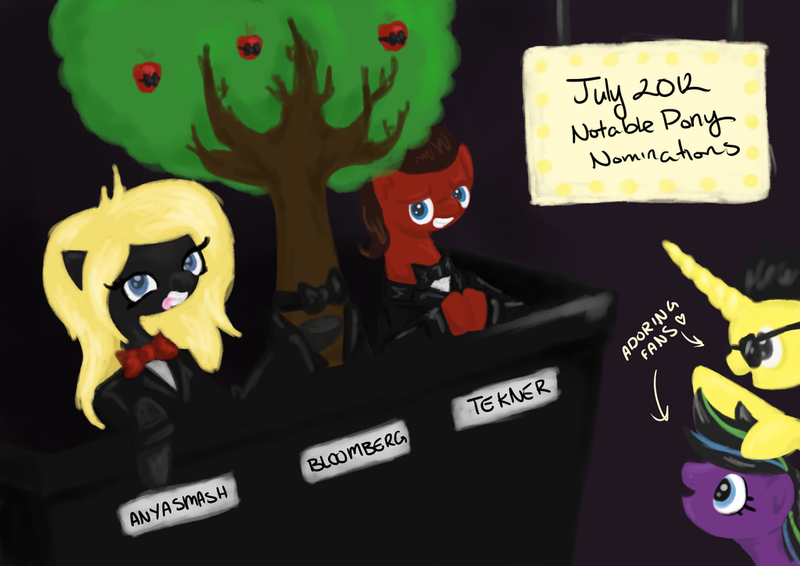 July 2012 Notable Pony Nominations! Thank you for being a kind and respectful pony on the Legends of Equestria Forums! For this, you deserve a fancy badge along with a title every pony dreams of! The time has come once again to hand out our fabulous "Notable User" award! This month, everyone's second-favorite programmer, Tekner, has been working on some magical scientific algorithmic witchcraft that will allow us to tally the votes using the power of internet robots! How exciting! Now all that's left is for you, our adoring fans, to vote for who you think should be the recipient of this fabulous and hallowed award! That's right, folks. You read correctly. One lucky fan will have their name elevated to the pantheon of the notable, and you will personally get to help choose who it'll be! Here's how: Just leave a comment in this thread stating "I nominate <name> because <reason>." Remember, this is being judged by super-advanced and super-finicky robots from the future, and everyone in the future talks like Bloomberg. So in order for your nomination to count, you have to make sure you've spelled their name correctly. You also cannot quote other's nominations, or it will not count. The names are also case-sensitive, which means that "I nominate AnyaSmash because she is the best pony, and I really like her mane," and "I nominate Anyasmash because I'm afraid of what she'll do to me if I don't," will be read as two separate votes for two separate beautiful geniuses, so please make sure you capitalize those capital letters, folks! You can't actually vote for me, of course, or any other member of the development team, because we already know we're the greatest. You can't vote for yourself either, because I like making lots of rules. Lastly, as always, you can only vote once, so make yours count! Now, without further ado, let the voting begin, and may the best user win! Here many great games such as Fighting is Magic, Ponykart, PonyCraft, My Little Investigations and many more will be featured over 2 days! Please headover to www.equestriagaming.com for all the information you need. We also attending Galacon! We are official guest of honor during this convention and it will feature a whole lot of fun such panels, auctions, voice actors, games and to top it all of, an actual gala on Saturday! The event is located in the the beautiful city of Stuttgart,Germany. The dates for the convention is 11th to 12th of August. Legends of Equestria will have a panel show what we been doing in the background during the summer. Not only that, we will also hold an auction plus sell things at our table! This is to help collecting money for Bronies for Good. As in the past; Legends of Equestria have helped charity before with The Massive Smile Project's official video. Remember, you will be able to play our game at the Convention! Our people that are going: SweBow (PR & Business), SteveLynx (3D), Dandy Lion (2D), Pa Hsia (CA) and Antlershy (Programming). Not only that, but in the end of September. We will visit the new and magnificent Canterlot Gardens in Strongsville, Ohio. The date you need to plan is 28th to 30th of September! It will feature guest as Tara Strong, Nicole Oliver, Andrew W.K. and many more. Canterlot Gardens will also feature a Gala and a DJ Pon3 party! We will also here have a panel where you have the possibilty to ask your questions directly to our team, updates who will be attending the panel will come later. Congratulations Travius Trott! Notable User Nomination - June 2012! Are you having a good start off to your summer? Well since the "Good Samaritan" badge idea got so many likes, we're going to implement it! yay! One lucky user will be getting an *extra-special* badge for their notable contributions of friendship. You don't need to add your location, and you may write your name as anonymous if you wish. Do this once and you shouldn't have to do it again for future nominations. Hope everyone has fun voting for their favorite pony! P.S. You cannot nominate any staff members. Hello! Forest Rain asked us if we had the possibility to help out with this video, and so we did. Musetrigger, Rice, Airbrush and Pa Hsia is our artists that helped out!